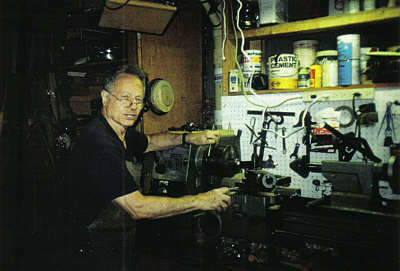 Fred Fenster’s home and studio are in the town of Sun Prairie, 20 miles outside of Madison, Wisconsin. 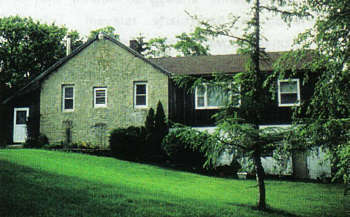 In a rural setting surrounded by acres of cornfields is the simple residence that was once the Goldenrod Cheese factory. According to Fenster, “as soon as I saw the basement, I wanted the house”. With barely a square inch unoccupied, Fenster’s studio is tightly packed into that basement space. The setup reflects the breadth of his love affair with metal, with areas designated for spinning and other lathe work, forming, raising, fabrication, soldering, annealing, and polishing. He has a huge selection of hammers and stakes displayed on the wall. There’s even a shower, in case work gets especially messy. Over the years, Fenster’s work has ranged from jewelry to holloware and flatware, to liturgical objects. He is at ease with gold but works more often in sterling or pewter. Today, more of his time is spent on commissions for Judaica and holloware than on jewelry. No matter what the material or technique, however, it is abundantly clear from looking at the shop and his work that the man really knows how to move metal. Fenster’s work falls comfortably into the modernist tradition. The eye travels the outside perimeter of the clean, graceful lines of his elegant forms, and is then seamlessly coaxed into exploring the body of the piece. Superfluous decoration that would interrupt this flow is seldom added. No extra icing on the cake; less is more. 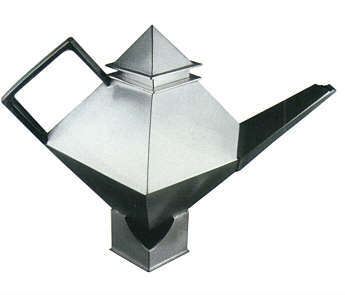 When a piece is intended to be functional, it’s important to him that it function well, that a teapot pour properly and not dribble, that hinges move smoothly and lids fit snugly. Forms are usually geometric and occasionally organic. Sometimes the two are juxtaposed within one piece. While it’s hard to say that form always follows function in his work, no matter which comes first, a sensitivity to both is always present. Fenster is especially adept at the use of scoring and bending techniques to produce unique three-dimensional forms. 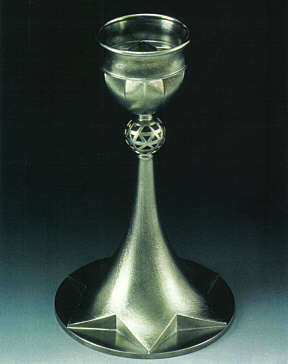 While sterling is well suited to this approach, it is especially effective and efficient when applied to pewter. Nowhere is this more evident than in one of his signature designs, the Kiddush cups. These cups are used in Jewish temples and homes to celebrate the Sabbath and other occasions through the ritual drinking of wine. Fenster very cleverly uses scoring and bending so that a Star of David seems to grow naturally right out of the foot of the glass. He then surprises the viewer with a second star, less immediately apparent, at the bottom of the cup’s bowl. This star is first seen on the outside of the bowl as an unrecognizable abstract form. It’s only visible as a star when the inside of the cup is viewed directly from the top, as one would while filling the glass with wine. After a period as an Industrial Arts teacher in New York, Fenster went to graduate school and received his MFA from Cranbrook Academy in 1960. He attended Cranbrook with Stanley Lechtzin and Michael Jerry and counts both classmates as important figures in his development. In 1962, he began teaching at the University of Wisconsin in Madison. A gifted and dedicated educator, Fenster plans to retire at the end of the 2004/2005 academic year after 43 years at the university. During his tenure, he has shaped several generations of American metalsmiths to approach their work with professionalism and skill. After all those years, he still brings remarkable energy and passion to his teaching He has also been very active on the workshop circuit, usually teaching holloware or pewter techniques. This past summer he taught at the Appalachian Craft Center, Penland School of Crafts and at Tainan College of Art in Taiwan. His extensive travels and teaching bely his shy and reclusive nature. At the end of a long day of social contact at school, he is happy to come home to a quiet and secluded shop. It is here that he seems most at ease. Fenster is an avid junker and frequently attends flea markets looking for unusual or bargain tools. He calls the flea markets “outdoor museums” and says he “junks to learn.” This attitude is apparent in both the quantity and quality of tools in his studio. His approach to learning is an active one that requires time, curiosity, and a continuing drive to enrich his already extensive knowledge of his chosen material. One of the great things about a career in a creative area is that if you work it right, as Fenster clearly has, it can offer a lifetime of growth and learning. You can’t ask for much more than that. Donald Friedlich is a jeweler in Madison, Wisconsin, and a former president of SNAG.